"Dream is a second life." Nerval's Aurélia begins with these words and in an instant the reader is pulled into the reverie of the imagination even as the narrator pushes back by explaining his announcement. A woman whom I had loved for a long while, and whom I shall call Aurélia, was lost to me. The circumstances of this event, which was to have such a great effect on my life, are of little importance. Each one of us can search his memory for the most heart-rending emotion he has known, the most terrible blow that fate has inflicted on his soul. It is a question of deciding whether to go on living, or die. Jeffrey Lewis also makes an announcement in the foreword to his quartet of romans à clef now collected in a single edition. 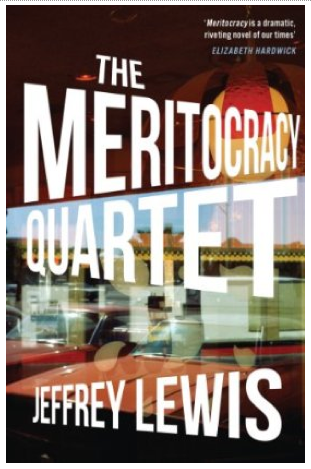 I had in mind to write a kind of 'meritocracy' series, novels that would chart the progress of my generation, or anyway the narrow slice of it I knew well. The first book, in retrospect, came easily enough. Nothing ever comes easily enough, but I had a story to tell that was clear and seemed true enough, and I had feeling to put into it that had never gone away. It was the story of my hero in college, Harry Nolan, who might have been president of the country one day, and his wife Sascha Maclaren on whom I had a crush. My sixties book, so to speak. Seventies, eighties and nineties books follow. However, this announcement is a quotation from the third book Theme Song for an Old Show. So, like Aurélia, the expedition begins by seeking justification in itself and thereby places a curious pressure on the quartet's overt narrative. Harry and Sascha are apparently invented names though the narrator Louie is overtly Jeffrey Lewis, a Jewish outsider to the old money, Ivy League class of Christians we recognise from the days of the Kennedys; the diminutive forename, the Irish surname. George W. Bush and John Kerry are said to have emerged from the same year at Yale. 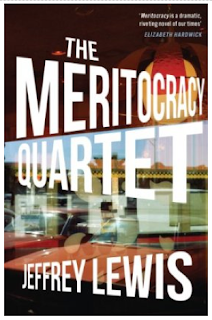 The first novel Meritocracy: A Love Story begins with the couple, Louie and other graduates, Adam Bloch, Cord and Teddy – again, the names are enough – travelling for a weekend of sailing in Clements Cove on the Maine coast. You can picture the screenplay with Morgan Freeman's maudlin voiceover as the group drive through the New England countryside: banter, laughing, wind in blonde hair. Narration here takes the appearance of an American rite – a million bildungsromans now. There follows wonderfully evoked fog-bedeviled boat trip and an evening at a country fair. But the voiceover inevitably cloaks such light in the shadow of time passed, and, to the reader's dismay, the love story ends abruptly with a terrible event and the book we had been seduced to expect dies. In the seventies novel, The Conference of the Birds, the glowing prose of nostalgia becomes an agitation as Louie joins a new age community in New York. The cast changes, the sentences become shorter and the story becomes darker, unhappier, as various troubled souls pursue careers, relationships and spiritual enlightenment. Louie seeks precise awareness of what happened with mantra phrases mimicking cultish teaching: "Go back. Calm down. Sense. [...] Go back. Gently. Sense. Look. Listen. Broadway. Wind whipping the trash." Once again, the novel ends with a terrible event as a narrative full stop. Jeffrey Lewis made his name as a writer on the hit eighties cop show Hill St. Blues which, in the third novel Theme Song for an Old Show, becomes (inexplicably), Northie. However, those of us with happy memories of the show will be disappointed if they expect a behind-the-scenes exposé, for it sits rather in the background to the story of Louie's relationship with his distant father. Even his marriage is a sideshow to a broken-home mom & pop novel. Again, a death punctuates the story. I told [my father] that in a matter of years I would take my winnings and quit and go write my books even if I had no idea yet what my books would be. I just thought, somehow, they must be there. Why are these books so obscurely sought away from public life and public success? Perhaps it is because, in a meritocracy so presented, the ability rewarded is the ability to write a generic TV drama, something depending on contingent application; mere opportunism. The quartet's implicit question seems to be: after progress, what remains? The final novel, Adam the King, is Louie's definitive attempt to resist this tendency, to remain on this side of sleep. It tells the story of Adam Bloch's return to Clements Cove to complete a trajectory from outsider to apparent insider as billionnaire businessman. For thirty years ago his role in Sascha's death remained unresolved but now he has married her sister and has built a mansion their future. Louie narrates as an observer otherwise uninvolved in the story. He even includes lengthy reports on the life of local blue collar workers living nearby in trailers. Their dialogue is repeated without his presence. Adam's physical redemption is confirmed with another moment of contingent application that is so unconvincing we can only be reminded that this is fiction and subject to generic laws; it does round things off very neatly. Bloch is Jewish too and, rather like his namesake Albert Bloch in In Search of Lost Time, entirely secular. He may therefore be Louie's alter ego just as it is said Albert is Proust's: the one who seeks redemption in the world, as opposed to in art or religion. Rounding things off with varnish, Adam embraces Judaism before his narrative-punctuating death, and thereby, as it happens, also reversing its suppression by Proust's Bloch's. Yet his redemption is also very Christian: the freest generation in history seeks its justification in death. While Louie's crush on Sascha is not on the same neurotic scale of Nerval's Jenny, Proust's Albertine or Dante's Beatrice, it shares their embodiment of an enchantment that never dies. Her death is a question to meritocracy. We suspect Louie, and by extension Jeffrey Lewis, sought to write novels akin to the disaster of her death while remaining in thrall to the worldly subject, to the novels “America” demands by virtue of being America. Perhaps this is a cultural necessity competing with the creative work of another existence. It is possible that Sascha's presence is a mere mark on a chart of progress, but her presence pulls the writer and reader toward the first moments of sleep. Writing is a second death.